Rockdale Branch Senior Vice President and Cashier, Gladys Skubal, has been an integral part of the Citizens National Bank family since 1974. At that time, (when CNB was still Rockdale State Bank), Gladys began as a bookkeeper — prior to the bank bringing on a computer system. Not long after, she moved to the position of Proof Operator and later, Teller. Over the next several years, she’s risen through the ranks as Assistant Cashier, Cashier, and now as Senior Vice President / Cashier. 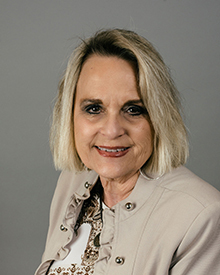 In addition to her ample firsthand experience, Skubal attended Southwest Texas State University and has completed numerous banking courses throughout her career. In 2015 she earned the impressive ACH Certified Professional designation. These days she is in charge of backroom operations and is the general “go-to” for any CNB Branch needing help or advice. Skubal has always loved numbers and solving problems and feels banking has, for her, been an ideal career. She’s passionate about learning, banking and helping others so it’s no surprise that she’s the one often called upon for tackling challenges. It’s important to her that she takes time and care to see her solutions are understood, as she recognizes empowering coworkers with knowledge makes the bank as a whole more efficient and stronger. When not working, Skubal has an intense enthusiasm for playing dominoes, and fantastically fashionable shoes. She loves spending time with her family, including her grandchildren whom she says are a “great joy” in her life. When it comes to relaxing, she prefers the beach. Sand and waves present or not— she cherishes music, dancing, movies and dining with friends and family.